Dr. Martin R Back, MD is a Doctor primarily located in Tampa, FL, with other offices in Tampa, FL and Gainesville, FL . His specialties include Vascular Surgery. He speaks English. Dr. Back has received 3 awards. 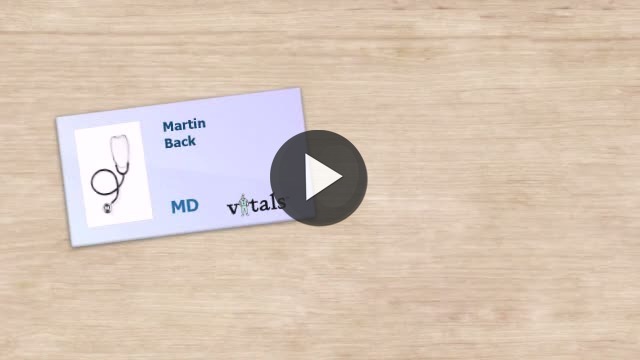 The overall average patient rating of Dr. Martin R Back is Great. Dr. Martin R Back has been rated by 26 patients. From those 26 patients 8 of those left a comment along with their rating. The overall rating for Dr. Martin R Back is 3.8 of 5.0 stars. He saved my mother's life. My family will forever be great full to him. awesome! Everyone is very helpful and friendly, we had Dr. Back for mom's surgery, and he is one special guy, then we had Dr. Armstrong for the follow up visit, and again one great doctor, couldn't ask for better. Take a minute to learn about Dr. Martin R Back, MD - Vascular Surgery in Tampa, FL, in this video. Dr. Martin R Back is similar to the following 4 Doctors near Tampa, FL. Have you had a recent visit with Dr. Martin R Back? Select a star to let us know how it was.